The area I know well and where most of these properties are located, is that peninsula from Pentewan southwards. 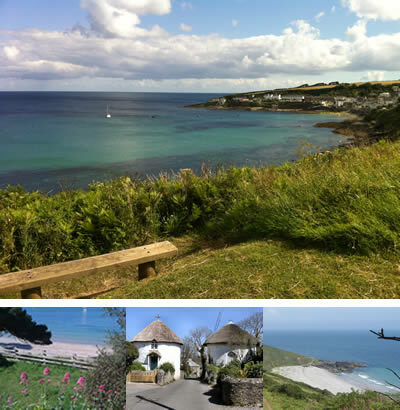 The bit I know really well and strongly recommend is Gorran Haven and the lovely beaches and coast either side. The countryside inland is also quiet and unspoilt and the few tiny hamlets here are a good alternative to being right by the beach. In any case, you are never more than 3 miles from the coast here. There are some lovely walks inland too, through woodland and traditionally farmed land. Cornwall is a wonderful place to know and to grow up in – its magic is apparent when just passing through. I hope you will feel at home here too and that this website helps you to do that. Gorran Haven has a handful of small shops supplying everything you need for a short stay and probably much more than you need for a great time on the beach. There are two cafes, a restaurant and a pub all serving meals and snacks and the bakery makes its own pasties. Gorran Haven Beaches - West of Gorran Haven are the beaches of Vault and Hemmick. Both are absolutely beautiful and very suitable for a day equipped with picnic etc. Neither are easily accessible by car. Caerhayes beach, west of Hemmick, has a café/shop hidden amongst sandy dunes and also a carpark. It also has a pleasing castle whose gardens are sometimes open to the public. Portloe - "One of the least spoiled and most impressive of Cornish fishing villages"
Portloe is considered by many to be the jewel in the crown of the Roseland peninsula and one of the prettiest villages in Cornwall. It’s steep sided valleys has meant that it has managed to escape development over the years and many buildings differ little from when they were built. Sir John Betjeman said of Portloe "One of the least spoiled and most impressive of Cornish fishing villages". Cornwall is home to some of the cleanest beaches in Cornwall and the Roseland Peninsula is also home to some of the most beautiful which, even during the summer months, remain relatively uncrowded. From the pretty village of St. Mawes, which looks out over the River Fal towards Falmouth, around to the old fishing village of Mevagissey, are fabulous beaches, coves and villages steeped in marine history and Cornish tradition. Veryan, Tregony and Ruan Lanihorne are just a few of the unique villages dotted over the peninsula that have become popular with tourists, boasting good restaurants, attractive shops and a number of galleries.